Are Christians forbidden to eat pork? The above graphic was emailed to me with a request for my thoughts. At first, I am a little amused by the image. For the sake of full disclosure, I am an avid carnivore. I delight in consuming a myriad of mammalian and avian life. I have no qualms about hunting, killing, gutting, butchering, cooking and then eating a critter. I have no desire to give up my meat eating ways, nor restrict them in any fashion. That being said, if the Bible commands me as a Christian to stop eating a particular animal, I will obey the Word. The question implicitly answered in the above image is that modern day American Christians do not have license to eat porcine food products (and I assume that also includes other foods prohibited in the Old Testament). The statements made by the graphic designers are factually accurate. 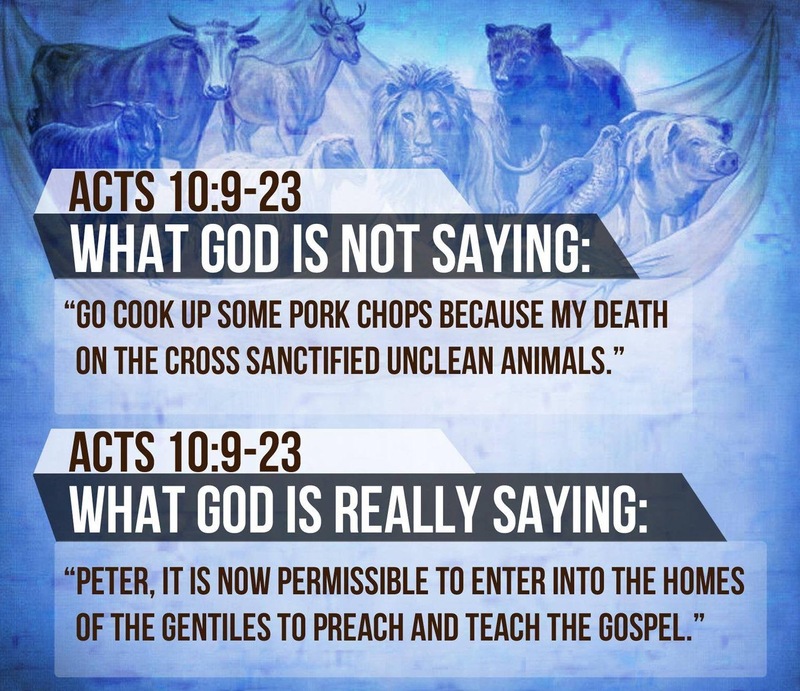 Peter’s vision in Acts 10:9-16 was not given to lead him down the path of bacon and pork chops. Peter’s vision prepared him for ministry to the Gentiles. God was giving Peter a poignant object lesson to break down the barriers of prejudice that were still in the hearts of many Jews- the disciples included. However, to us the above truth as evidence we should not be eating pork would be to overlook or ignore a number of other very clear passages. We have to draw a clear line between the Jews of the Bible and the Gentiles of today. The question at stake is if believing Gentiles are under the dietary restrictions of the law of Moses. That question was answered clearly and definitively in three distinct places in the New Testament. Acts 15 is the first time the church addressed this specific issue. As the gospel spread throughout Gentile regions a group of men began teaching that Gentiles must also keep the laws of Moses to be saved. In Acts 15, church leaders from Jerusalem and Antioch met together to address the matter. Peter was one of the leading voices at that council. After mentioning how God used him to first take the gospel to the Gentiles he said, “Why tempt ye God, to put a yoke on the neck of the disciples, which neither our fathers nor we were able to bear?” Paul and Barnabas spoke after Peter and declared much the same thing. James, the pastor of the church in Jerusalem, stood and concluded the meeting by affirming that Gentile believers are under no obligation to keep the ceremonial and civil restrictions of the law of Moses. This conclusion was later affirmed by the entire church, and was a major part of Paul’s correction of the Galatian and Colossian errors. In fact, in his first letter to Timothy Paul declared that any one who forbade eating meats was teaching a demonic doctrine. The New Testameny explicitly teaches the Gentile Christian has no obligation to obey the laws given to the Israelites, including dietary restrictions. American Christian’s today can enjoy or abstain from all varieties of meat. We are under no specific command to imbibe or forsake any kind of meat. Instead, we give thanks God who has made us clean through Jesus. We rejoice that because of Jesus, diet plays no part in our standing with God. ← Why are there so many different kinds of churches?